Phragmipediums are the tropical cousins to the north american ladyslipper. They are native to south america north to panama and guatemala. Phragmipediums light requirements are much brighter than the paphiopedilums, 2,500 to 3,500 footcandles. This is about the same as cattleya light. The ideal position is about one foot from an east, west or south facing window. They will also excel in a light garden. Most phragmipediums require a night temperature of 55f to 65f, with a day temperature of 65f to 80f. 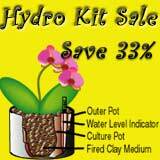 Growing your orchid in the hydroculture planter takes all the guess work out of when to water and how much. Water your phragmipedium when the indicator reads min. Pour the nutrient slowly into the clay pebbles next to the water level indicator. Water until the indicator is just below the "opt" level. Always be sure to water when the indicator reaches the "min" level. Phragmipediums have no psuedobulbs and should never dry out. They live in high rainfall or seepage areas, so their roots are extremely sensitive to an excessive amount of nutrient in the growing medium. If your water source is hard water you may want to water with distilled or rain water in order to keep the medium free of a salt build-up. Once a month, rinse the foliage and the clay pebbles under tepid running water to remove any dust and accumulated plant food from the growing medium. Be sure to blot dry any moisture that is in the crown of the plant. Return the culture pot to the outer pot and water with the nutrient solution. Alternate with plain water the next time you water. This watering pattern will help to avoid a mineral salt build-up.